USMC Marines Tactical Pocket Knife Spring Assisted Opening Knives - The EXTREME line of spring assisted knives are for those who truly require a heavy duty knife. These knives were designed by Retired US Colonel Peter Hoffman. They feature an all metal handle with a razor sharp half-serrated 1045 surgical steel (tool steel) teflon coated blade. Each knife comes with a removable belt/pocket clip and contains a steel tip window smasher on the handle. Just press the back of the blade, and it flies open and "snaps" in place via the sturdy liner locking mechanism. This is a beautiful and solid built knife that won't disappoint you. If you could only own 1 knife, make it an EXTREME knife! 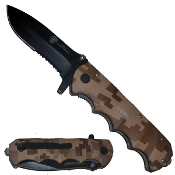 Desert Camo handle reads, "USMC"
Blade reads, "Marines: The Few. The Proud."